Macedonia, up in the north of Greece is a cozy enclave of pure green. Its chok full of history, culture and really awesome food. Oh yeah, and it’s the birthplace of the legendary Greek King Alexander the Great. Thesaloniki, the cosmopolitan capital of the region, also happens to be Greece’s second largest city, and is by all accounts the food capital of Greece (move over, Naxos). Famous concoctions include the ubiquitous frappe, and the newly minted bougatsan-a hybrid between a croissant and the traditional custardy bougatsa pie-which has been extensively celebrated by non other than Saveur magazine amongst others. If you find yourself in the area and in the mood for something sweet, stroll down to Estrella café (where it first began life) or any other self respecting joint. Thesaloniki has long multicultural history with French, Sephardic, Roman, Byzantine, Balkan, Arabic and Mediterranean influences seen all around the city in the form of the Rotonda, the minaret and the still preserved Jewish quarter amongst many others. The architecture is a mix of neo-classical and modern, even though you’re likely to see many more. The White Tower on the boardwalk is a fantastic example of a Byzantine fortification and easily the city most recognizable landmark. The Rotonda and Galerius’s Arch are equally as impressive as Byzantine structures, while its minaret stands as reminder of the ottoman influence on the city. Thessaloniki thrives as a student town, its wide streets and plateias lined with outdoor cafes and bars. Outside of Thesaloniki there are several other interesting sights and things to do that are not to be missed. First and foremost, there is the Pella and Vergina archaeological sites situated near Thesaloniki. The tomb of King Phillip, father of Alexander, is situated in Vergina. Both have museums that house the many artefacts found, and are Unesco World Heritage sites. 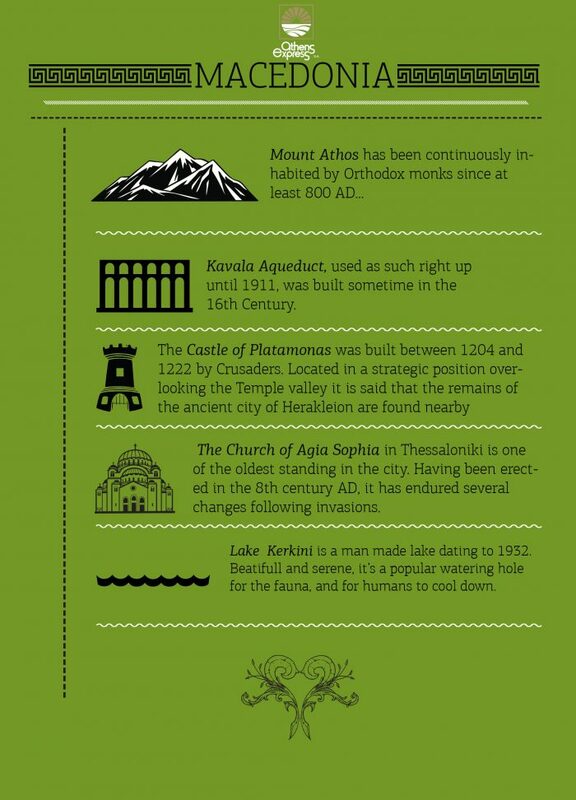 Kavala offers some neat historical sites. Its aqueduct runs through the city like a metro rail, while the Castle and its fortification on top the acropolis is a magnificently preserved structure. The ancient city of Philippi rounds up your Macedonian experience of ancient culture. Of particular appeal is the finely preserved theater and agora. Natural beauty is another thing going for the region of Macedonia. Lake Kerkini was man made in 1932 out of marshlands and is a diverse eco-system of endemic and migratory birds and several other species. It’s a nature buff’s dream! Holidays in Greece are guaranteed to leave you with a sense of awe in nature and admiration for the long and intricate history of the region. Steeped in millennia old legends and mythical natural beauty, Macedonia is ideal all year round!